My last post was all about simplifying, but what if you need to add to your closet? I’ve already admitted I have a bit of a shopping problem. In fact, that’s one of the main reasons I decided to simplify my wardrobe. I wanted to say goodbye to regrets and impulses that clogged up my closet and were seldom worn. Cutting back on the retail therapy is helping me maintain my cleaner closet. But clothes do wear out, especially if you are wearing them more often! Lifestyles, jobs, seasons, sizes, and bodies change. Sometimes we do need to shop in order to maintain a functional wardrobe. This is a huge relief to me, as I’m not ready to give up shopping entirely. I wanted to let you in on my biggest secret for building and maintaining a capsule wardrobe on a budget: thrifting. 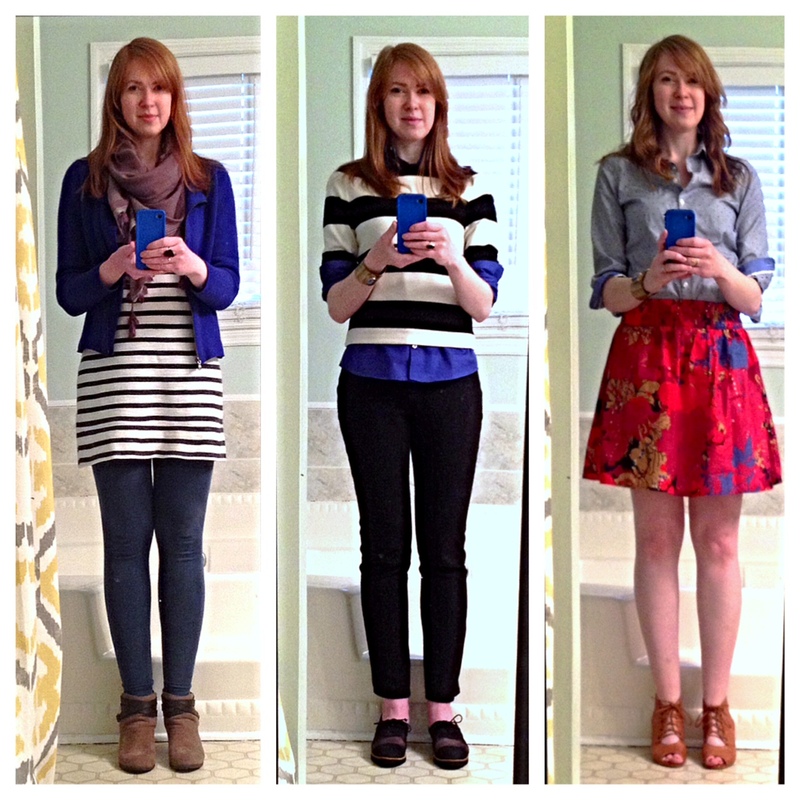 Here are some looks from my late winter/early spring wardrobe. Each of these outfits includes at least one secondhand item. Can you guess which items were bought secondhand? Nearly a third of my summer capsule is secondhand. My closet includes clothes from J. 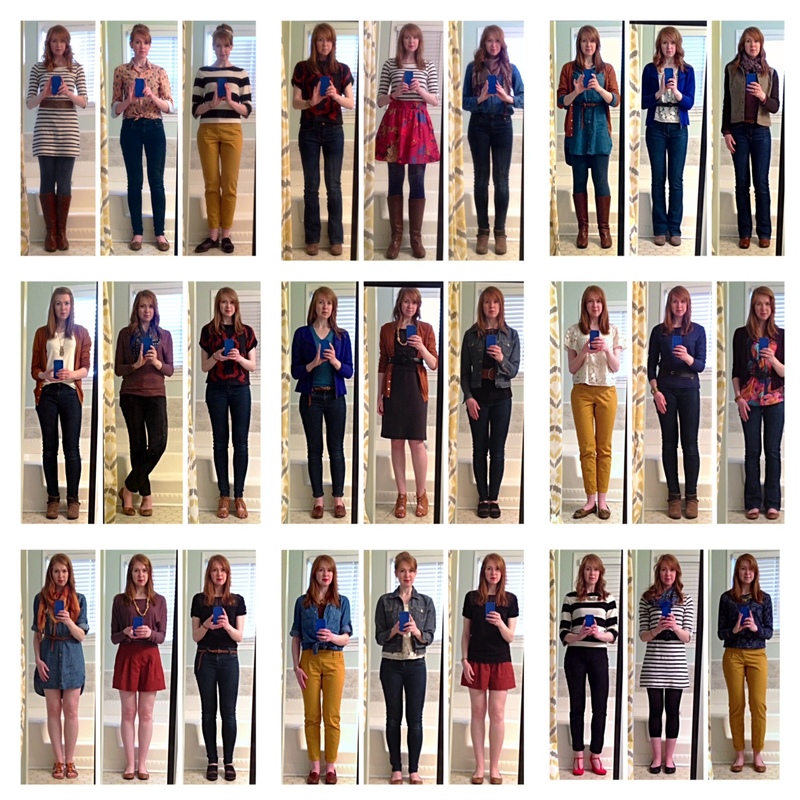 Crew, Banana Republic, Anthropologie, Nordstrom, Lord & Taylor, and Stuart Weitzman. All of these items together cost me less than $50 because I bought them at the thrift store. Most of these items appeared barely worn, and some were new with tags. I don’t care much about brands, but I am thinking more about quality as I shop. Buying things secondhand makes higher quality items more budget friendly. I started shopping at thrift stores when I was in junior high school, primarily so I would have a wardrobe that was different from what my classmates were wearing. I liked the idea of building a look that wasn’t straight off the mall racks, and I still have an eclectic style in my home and my wardrobe. I continue to enjoy treasure hunting and regard my best thrift finds somewhat like trophies. I’ve tried to restrain myself from enthusiastically responding to a compliment with “Thanks! This was only five bucks!”, as I’ve found most people aren’t as excited about my deals as I am. 1. Look for quality and value. Familiarize yourself with labels so you can recognize whether a shirt came from Walmart or Neiman Marcus. In general, a secondhand Old Navy tank top is not going to be a good value, as it could be found new and on sale for a similar price. Check for condition (no pilled sweaters, stains or twisted side seams). Factor any necessary dry cleaning or alterations into the total cost. For example, I found $100 jeans for $7. Even though they need a $10 alteration for the best fit, they are still a good total investment for me. 2. Try it on. Even if a tag lists a size you don’t normally wear, it might be worth trying on the item. Clothes sometimes end up in thrift stores because of mismarked sizes or inaccurate fit, and these mistakes could be to your advantage. Sizing conventions for vintage clothing and international brands also vary greatly, so don’t count something out based on listed size alone. Also consider whether an inexpensive alteration might make the item a perfect fit. If you’re handy with a sewing machine, you could even do these yourself! 3. Have a plan. Make a list of items you’re looking for to replace or fill the current or next season of your wardrobe. It’s helpful to think in advance of wardrobe needs when thrifting, as it’s unlikely you’ll find the exact item you’re looking for on the first try. My striped tunic dress is starting to wear out, so this is something I look for every time I go to the thrift store. I don’t need it urgently, but I can see the need on the horizon. I also want some type of olive or muted green top for fall, so I look through these color sections when I shop. 4. Try out trends. If you’ve been wanting to try a trend but don’t want to invest in an item you may only wear for a season or two, thrifting is a great way to give it an inexpensive go! I found my floral joggers (new with tags!) for $6 at the thrift store. I’ll enjoy them while I wear them, and I won’t feel bad about donating them back to the thrift store when I move on. For trendy items that aren’t likely to become classics you wear for years, buying secondhand can keep your cost per wear low. Since trends are often revisiting fashions of earlier eras, you may even find a vintage item that looks fashion forward (I’m looking at you, 90s crop tops!). 5. Go often. I regularly explore three or four thrift stores in my area. Because I go often, I am generally familiar with the merchandise and can spot new items fairly quickly. I actually enjoy searching through every item, but becoming familiar with stores in my area makes it easier to quickly browse. Merchandise also turns over regularly, so going often gives you the best chance of finding the item on your list before someone else does. 6. Search outside your area. Thrift stores often vary greatly by location. I like to occasionally look in other parts of town for a different selection, and I also try to find thrift stores when I’m traveling. Areas favored by retirees may have great vintage merchandise, and places inhabited by young professionals may have good options for an office work wardrobe. You never know what you’ll find, but trying out different places will give you the broadest selection. 7. Shop online. If you don’t have thrift stores conveniently nearby, or if you prefer not to rummage through racks, you now have some great online options. Sites like Twice and thredUP buy and sell quality used clothing. You can search by size, color, or brand. People can buy and sell clothes directly with one another through apps like Poshmark, and even Goodwill has the option to shop a selection of goods online. Of course, there’s always ebay (where I recently bought gently used boots for fall for 20% of their retail cost) and the vintage section of Etsy. If you don’t mind paying a little more for convenience, you may find shopping secondhand online can help you build your budget capsule wardrobe. What about you? Are you an expert treasure hunter with more tips to share? Are you a fledgling thrifter ready to give it a try? Do secondhand clothes have a place in your wardrobe? A new season of Project 333 began July 1st (more on that later! ), so now seemed like a good time to follow up on my first season. 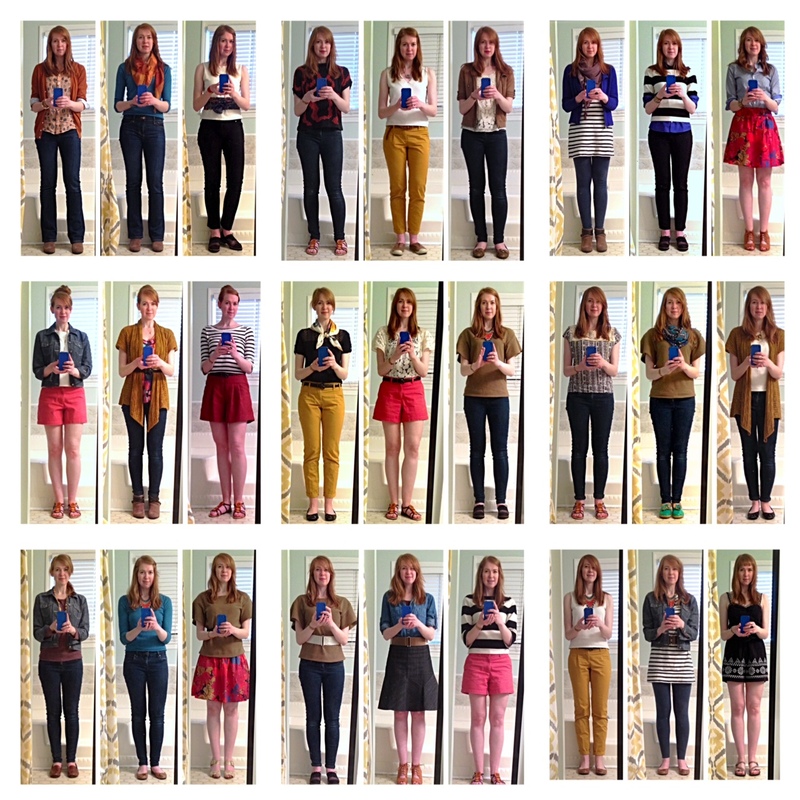 I began my own version of Project 333 in March and continued through May. I had a “between seasons” grace period for June and have now begun a new three month season. I survived three months with only 33 clothing items (plus shoes and accessories–my modified rules), and I actually enjoyed it–at least for the first eight or nine weeks. After that point, the weather started changing. I started getting a little bored. I made some extra money and bought a couple new shirts. I just…lost a bit of steam. But I also took two carloads of donations to the thrift store! I kept going back to my stored clothes and further culling my stash, and I know that will continue. I’ve noticed a modification in my shopping habits. My purchases are much more thoughtful, more intentional. I still make some impulse thrift buys, but my “It was on sale at Target!” spending is down significantly if not altogether gone. I consider this a win. I’m also looking more critically at fit and quality when buying clothes. Rather than shopping only for pleasure, I’m shopping with the goal of building a wardrobe that reflects my style and suits my lifestyle. I like to regularly update my home decor, and since I’m on a tight budget, I rearrange. My linen closet is half full of throw pillows new and old, and I change them out seasonally or move them around the house to freshen up different rooms. Instead of replacing my sofa, I buy throw pillows. 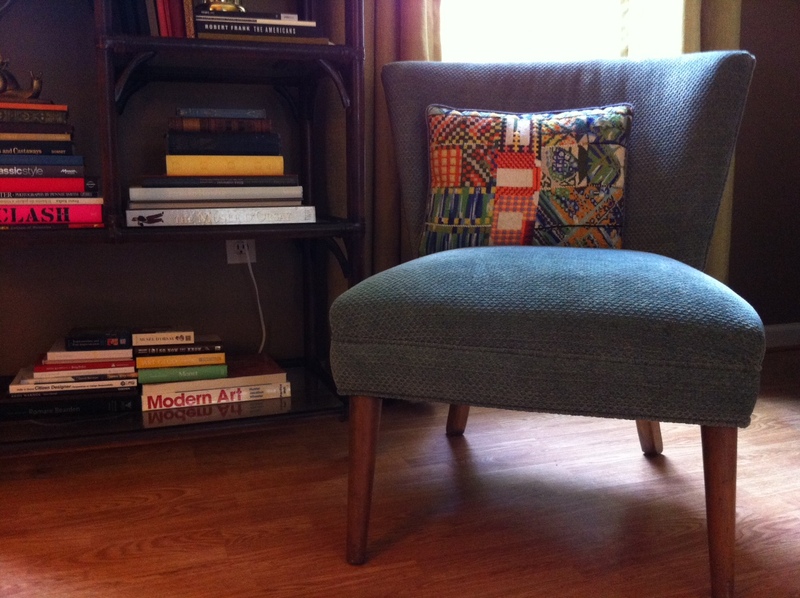 I’ve long admired Jonathan Adler’s fantastic needlepoint pillows and hope to own one someday. In the meantime, I’ve kept an eye out for thrift store finds that evoke a similar feeling of playful beauty. I chanced upon this piece on my third pass around the Panama City Beach Goodwill, and I’m a little obsessed with it. This handmade needlepoint sampler pillow measures 12×15 inches and cost me a whopping $3.25. The colorful, quirky mix of organic and geometric designs really spoke to me, and whether or not I ever add a Jonathan Adler pillow to my collection, I’m happy I found this one. How do you update your home without spending much money? What was the last thing you bought at a thrift store?